Can animals in spirit manifest gifts into our material world? 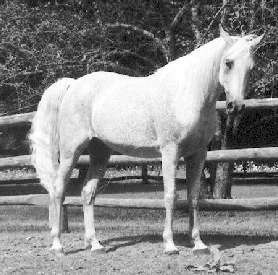 It was about a year after Echo, my Arabian mare, had been euthanized at the age of 32. I had cleaned up all her things and put them away. Horse blankets and brushes were washed and stored. Leather tack was cleaned, covered in leather preservative, and lovingly packed away. I had gone through all her things, including her medical kit, giving away what would not keep, and cleaning up everything else. Now I just had memories and my grief. I was sitting down to meditate one day when I felt Echo nuzzling my neck, as she used to do when she was in physical. I said hello to her and she responded with another soft wiggle of her nose against my skin. “Echo, would you like to be groomed?” I asked. I heard “yes”. We had been together for 22 years, and I knew Echo’s physical body intimately. With my eyes closed, I began with a rubber curry, starting on the left side of her neck near her head and working down her neck, over her withers, and across her ribs. I didn’t miss a single spot. In my mind, I curried her entire left side and then moved to the right side of her body. 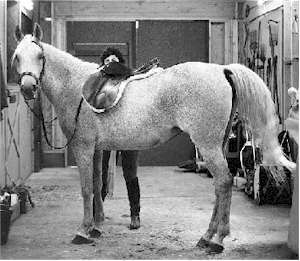 A curry brings up all the dirt and dust that horses collect when they roll to scratch an itch or remove dried sweat. Then a brush removes all the dirt and leaves a shiny coat. I was thorough in my mental grooming. I used all of Echo’s favorite grooming tools, including the rubber mitt with bumps that worked so well on her lower legs where horses have no muscles to protect their bone. After brushing her thoroughly, I combed out her mane, and carefully brushed her tail, separating each hair. I picked out all four of her feet. It was the same way I had groomed her almost daily all the years we were together. Echo had loved to be groomed. She would stand there like a princess being prepared for a royal visitor. She especially enjoyed having her mane and tail combed out. I could feel her satisfaction at the job I was doing, even though she no longer had a physical body with which to experience it. When I finished, I gave Echo a big hug, and opened my eyes. To my amazement, a half hour had passed, about the same time it would have taken me to actually groom her when she was alive. I got up and left the room.